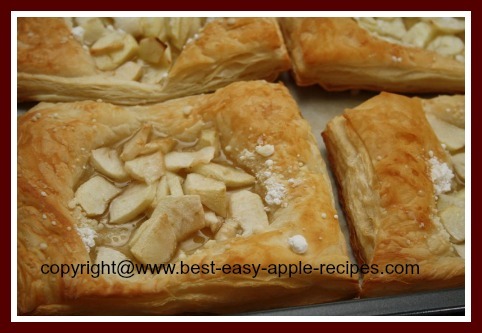 Apple Puff Pastry Recipes may look difficult to make, but with pre-made, store purchased, "Puff Pastry" they are actually quite simple to create. Pastries which include fruit, such as apples are my favourite type of pastry. This may be due to the fact that, when eating pastry made with fruit, it feels (somewhat) healthy, and I feel less "guilty" enjoying the treat! Puff pastry seems to be a relative of the Middle Eastern "phyllo", and is used in a similar manner to make elegant layered pastries. Pre-made, frozen, puff pastry is available in most grocery stores, which makes making these delectable treats much easier to create. Fruit strudels, fruit palmiers, and fruit turnovers are examples of pastries made with puff pastry. A puff pastry is a light, flaky, leavened pastry containing several layers of fat which is in solid state at 20 °C (68 °F). Puff pastry, in its raw form, is a dough which is spread with solid fat and repeatedly folded and rolled out. The spaces that form between the layers are a result of the puff pastry rising as the water evaporates into steam during the baking process. Piercing the dough will prevent excessive puffing, and crimping along the sides will prevent the layers from flaking all of the way to the edges. Enjoy both making and sampling these homemade puff pastry recipes!